The flight from Brisbane to Auckland was 2 and a half hours, arriving at midnight. With the check in time at 5.45am, there wasn’t many options. My parents live in Auckland, so they came and whisked me off home for the evening where I sat chatting with them through the wee hours until it was time to head back to the airport. The flight to Tongatapu – another 2 and a half hours – had barely taken off when I lapsed into a well needed sleep. With 30 minutes left in the flight, I awakened to a blanket of clouds below. Shortly after, it cleared leaving blue waters as far as I could see from the plane. Then, within moments, the Island of Tongatapu appeared magically from the great span of blue sky and puffy white clouds. The roaring waves of the beaches crash against the rocky beaches, but there is not a speck of sand as far as I could see. Palm trees are sprinkled lavishly across the entire island. The International airport is small, as you would expect from a small antisocial set of islands in the middle of the Pacific Ocean, and I met the man who would drive me to my accommodation on the island – Toni’s Guest House. The weather is warm – for winter, although there aren’t really seasons here. It’s muggy, and coming from a Brisbane winter – where the muggy has gone – it’s good to feel the heat again. About 70% of the main roads on the island have been sealed, mainly from the Chinese influence in the Kingdom, but the most common site on the trip to the guest house is the Chinese shops along the way, small brick buildings with grills on the from that are filled with all manner of packaged goods. There’s would be one on every street corner, if there were indeed streets to have corners. Toni’s Guest House is well set up. Several houses alone a dirt road run by an Englishman – Toni – and his Tongan family. The blue room, where I am staying, is a lavish and spacious area to stay. There aren’t many tourists around – they don’t get too many of those here. But even so, all of the rental cars have been taken already – there is a Mormon festival here at present. That is somewhat limiting for what I was intending, but will just go with the for and see how it goes. Every visit to the island should include the Friends Cafe, supposedly the best place in town to each at a decent price. I’m only here for two nights before moving on, so without a vehicle to move around in, I am dependant on Toni’s tour tomorrow. This afternoon I went for a walk around the main city of Tongatapu. Small when compared to pretty much any other city in the world, but it’s still quaint. Plenty of markets and the occasional flash building. The city is being rebuilt after it was put to the flame during the 2006 riots. 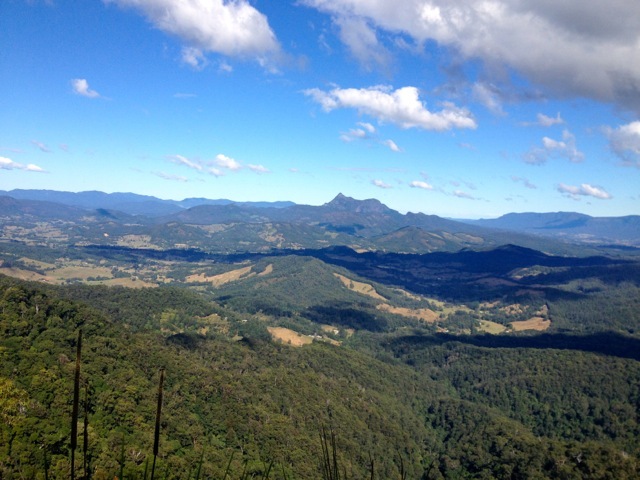 The Cougals National Park is a section of the Springbrook National Park on the border of Queensland and New South Wales. 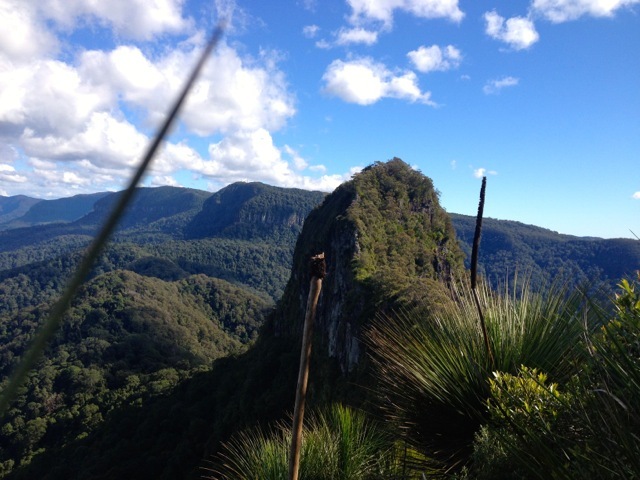 It’s a pair of peaks that rise out of the rainforest, rocky and beautiful. Note, this is different to the Mount Cougal Cascades, which is not connected to the peaks hike. The East Peak is the most commonly climbed and is a 8.5km return trip with a moderate grade. The West Peak has a hard grade and is a further 750m across a saddle, giving the total hike of both peaks 10km return. There is no formal trailhead for the Cougals walk. To get to the beginning of the trail from the Gold Coast cross the border into NSW and then back again along a dirt road named Garden Of Eden Road to a gate where there is room for several cars to park. 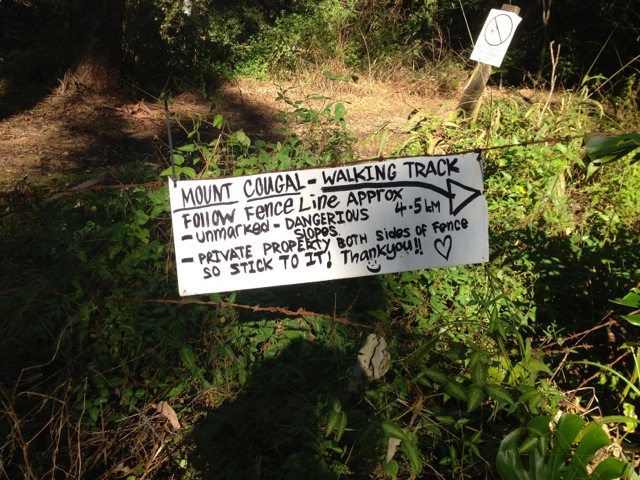 There are local’s driveways nearby, along with a handmade sign announcing the beginning of the walk and demanding hikers to stay on the track. 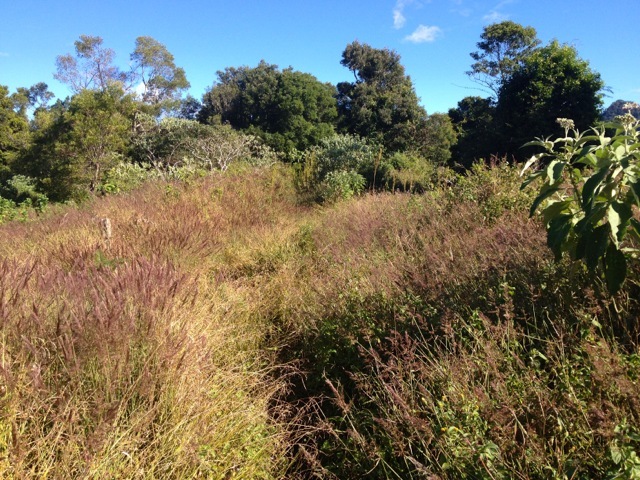 The trail heads west along the fence line between QLD and NSW. The fence has barbed wire along it, but whether it is designed to keep the New South Welsh out of Queensland is unknown. The trail climbs uphill through brush with low branches. It had rained this last week, so the dirt here was a little slippery. 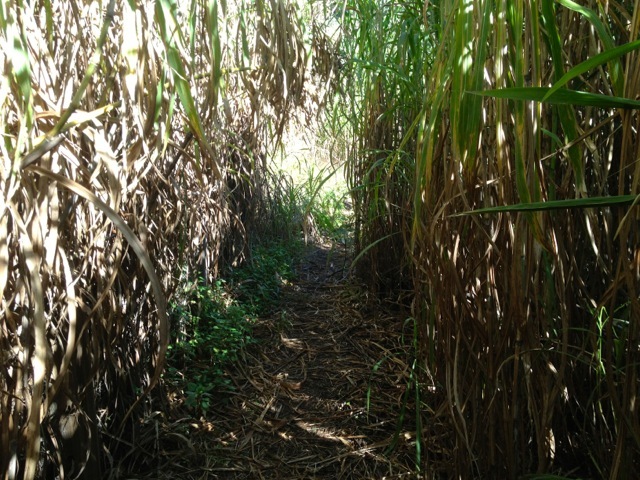 The brush gave way to tall grasses along the trail, which in turn gave way to thin bamboo growths. The grass overhanging the trail sometimes contained thorny branches. I probably should have worn long pants as I sustained many small scratches by the end of the day. The grassy path explodes into rainforest with tall trees and the typical Strangler Figs everywhere. The trail follows the fence line, climbing and descending gentle hills. It’s fairly obvious when you reach the first of the Cougals, the trail climbs steeply with dirt and tree root steps making it slippery after the recent rains. While slipping is the ever-present danger, being snagged on the barbed wire makes climbing even more dangerous. Caution is suggested. Atop the steep climb, rocky outcrops stand tall above you with dark brooding caves along its face. 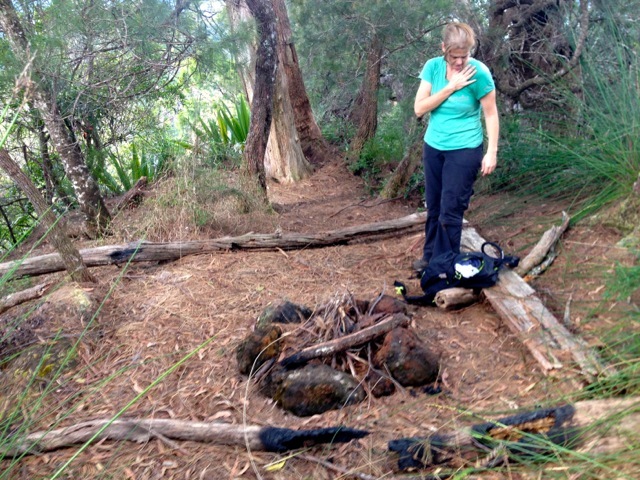 We walked along the base of the major outcrop until we found our way to a path that climbed through it. 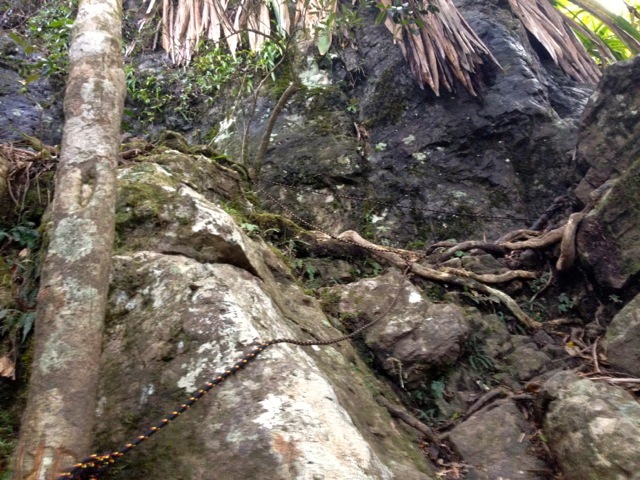 The trail up the rocks was obvious as someone had tied a rope to aid with handholds. 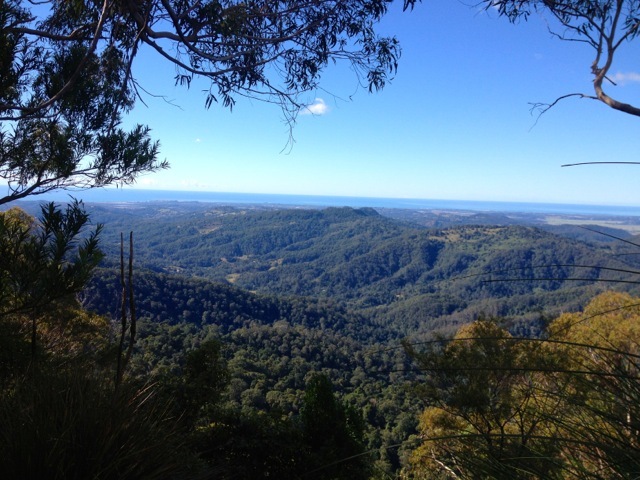 …the rocky face of West Cougal to the West, out to the coast towards the city of Tweed Heads out to the East and Springbrook National Park to the North. On this sunny day, the climb was well worth the effort. My companion and I did not stay long, however, deciding to push on before lunch. We climbed down to the saddle between the peaks with only one steep troublesome and slightly precarious climb. The trail crossed the saddle, but unable to find a suitable place to stop we proceeded around the great rocky outcrop known as the West peak, looking for an easy path up. The West peak looks to be a hard climb with its many rocky faces. We skirted around it passing a couple of rocky climbing places marked with pink ribbons until we found a dirt path through the undergrowth. It was a little slippery but surrounded by plants that gave plentiful handholds. While finding the route up was not the easiest, climbing up it was fairly straight forward. Unlike the summit of the East peak, which is small, the West Peak has a large area with meandering pathways and what appeared to be a camp site. We stopped for lunch at the fire pit. The descent passed quickly, as it always seems to, and before we knew it we were slogging our way through the tall grasses and back to the car. The Cougals is an awesome hike and I would recommend it to any fit and capable walker. It’s going down as one of my favourites in this region.